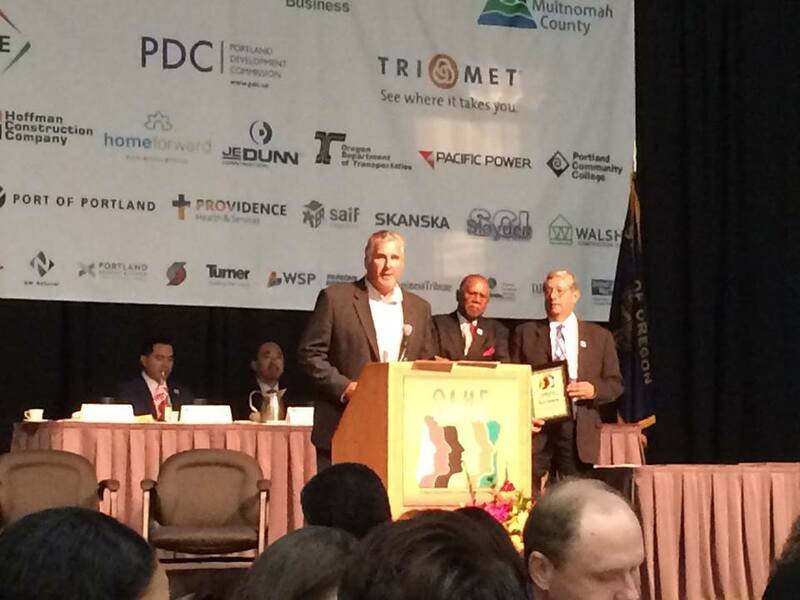 We are honored to receive Oregon Association of Minority Entrepreneurs' Construction Company of the Year award accepted on behalf of WALSH by our President, Matt Leeding! This award is given to the General Contractor that has best exemplified OAME’s mission to promote and develop entrepreneurship and economic development for ethnic minorities thereby reducing racism and discrimination. Our commitment to diversity in construction is a continual, integral part of how we do business. WALSH has promoted diversity within our own ranks, and with our business and subcontractor partners, for over 50 years. We have always believed that a strong workforce reflects the diversity of people within our community. WALSH was the first contractor west of the Mississippi to receive the Minority Contractor Utilization Award, given to us in 1987 from the U.S. Department of Housing and Urban Development (HUD) in recognition of our dedication to engage, include and mentor minority, women and emerging small businesses on our projects. Our participation record is unparalleled in the Northwest and our dedication to improve will continue to enhance our community outreach efforts moving forward. While community participation plans are part of many projects that we do, these efforts are not exclusive to projects that require participation. Subcontractors and workers who we have initially contacted on projects like this have gone on to work with us on private projects as well. As a company and as individuals we take great pride in the role we have played in the growth of many firms and individuals through these opportunities. We have been able to pass on our success to scores of companies and workers by way of structured mentoring and training programs that have helped many start or further successful construction careers or businesses. We understand and recognize the uniqueness in everyone, valuing the contribution that each can make, and strive to create an inclusive work environment where awareness of and respect for those differences is promoted. Our commitment to a diverse construction industry extends into children's programs, including the Oregon Tradeswomen "Women in Trades Fair", where we have been a sponsor and contributor since its inception in 1993. We deeply believe in inspiring and encouraging diversity for the next generation of construction professionals.